Athens, Tenn. (April 19, 2011) – To celebrate the start of warmer weather, Mayfield Dairy has introduced one new Creamier Churn and four new Select Ice Creamier flavors—and an O’Charley’s dessert-inspired treat leads the field of new additions. If caramel is what you crave, then you can now enjoy the delicious caramel of O'Charley's famous caramel pie by the scoop. Mayfield O'Charley's Caramel Pie Ice Cream is a rich, delectable medley of caramel ice cream, swirled sweet caramel, graham cracker pieces and chocolate-covered caramel cups. Mayfield Peanut Butter Fudge Ice Cream is a dream-come-true for ice cream lovers that have longed for a peanut butter and fudge combination from Mayfield. Peanut Butter Fudge features chocolate ice cream with a swirl of peanut butter—simple, delicious and sure to be an instant hit. Mayfield Bear Claw Ice Cream features creamy dark chocolate ice cream filled with chocolate-coated cashews and luscious swirled caramel. Ice cream connoisseurs will do just about anything to get their paws on a bowl of this new treat. For Atlanta Braves fans, Mayfield Triple Play is a home run. 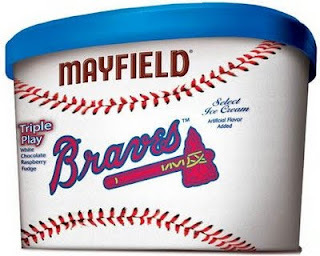 The official ice cream of the Braves, Triple Play features white chocolate ice cream with a raspberry puree and raspberry-filled chocolate cups. Mayfield Triple Play Ice Cream, in the Atlanta Braves commemorative carton, is available while supplies last in select stores. And last, but certainly not least, there is Mayfield Creamier Churn Moose Tracks. Featuring vanilla ice cream with peanut butter cups swirled with fudge, health conscious ice cream lovers will enjoy this indulgent treat that is made with half the fat of regular ice cream. Mayfield’s four new Select Ice Creamier and one Creamier Churn flavors, along with a new pint offering of Mayfield Mint Chocolate Chip ice cream, are in stores now. Founded in 1910, Mayfield Dairy Farms is celebrating 100 years of delivering fresh, great-tasting products customers love. Based in Athens, Tenn., Mayfield offers a full line of milk, cultured and ice cream products and serves nine Southeastern states. Tours of the dairy’s plants in Athens, Tennessee and Braselton, Georgia offer an inside look into the history, production and great flavor of Mayfield products. To learn more about Mayfield Dairy Farms, visit http://www.mayfielddairy.com/, or on Facebook at facebook.com/MayfieldDairyFarms.